Upgrading to a sedan signifies that you are doing well in the world. At least enough to make your neighbours jealous. Well, that was until the SUVs took over and people started to opt for a bigger and more premium looking vehicle that isn't that far away from the current budget. 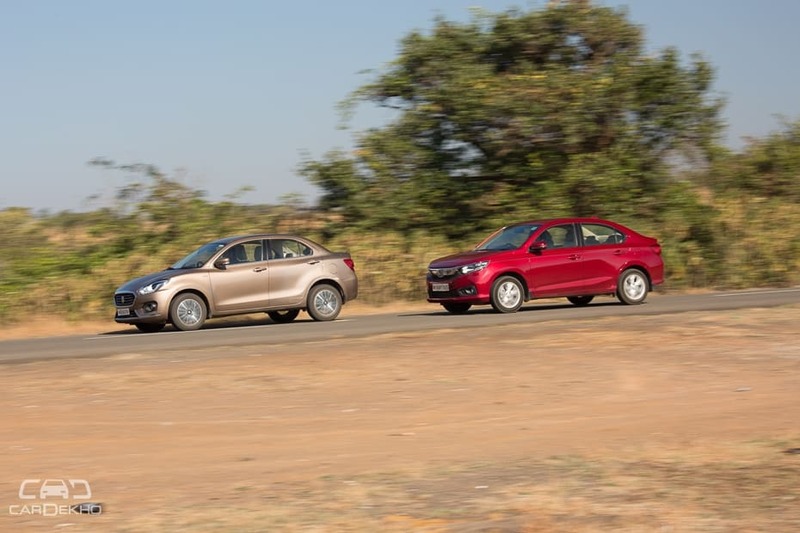 But sedans still remain the classier choice and if you are upgrading to a sub-4m one, numbers suggest you might be eyeing the Maruti Suzuki Dzire. Our earlier comparisons of the diesel-manuals had proven that it was the better car of the lot. 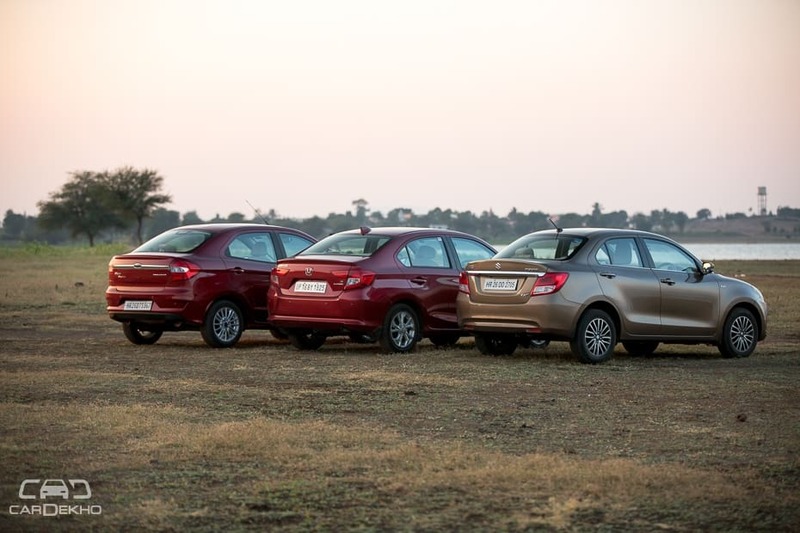 But with the Honda Amaze getting a major makeover and the Ford Aspire getting a new ‘Dragon’ petrol engine, can the Dzire still hold the throne? Of the three, the Maruti Suzuki Dzire looks the most ‘sedan-like’ with its proportions. It is the widest car of the lot which lends it a more prominent stance. 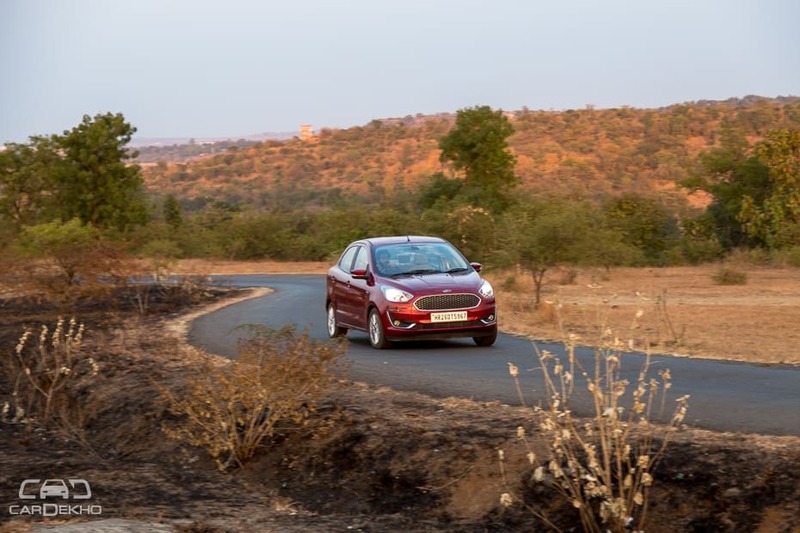 Helping the Dzire’s case further are the LED projector headlamps with proper daytime running lights which make the Dzire stand out at day and night. The Dzire’s two-tone 15-inch alloy wheels are also better looking than the other two. At the back the Dzire hides light guides in the taillamps, and a fat chrome bar makes it look classy. The Honda Amaze is the smallest car here and looks aggressive with a sharp design. Apart from this, there are hardly any features which help it stand out as it gets regular halogen lamps with dim daytime running lights. And the wheels, though well designed, look plane-jane in the silver monotone. The Ford Aspire looks the most sedate of the three. 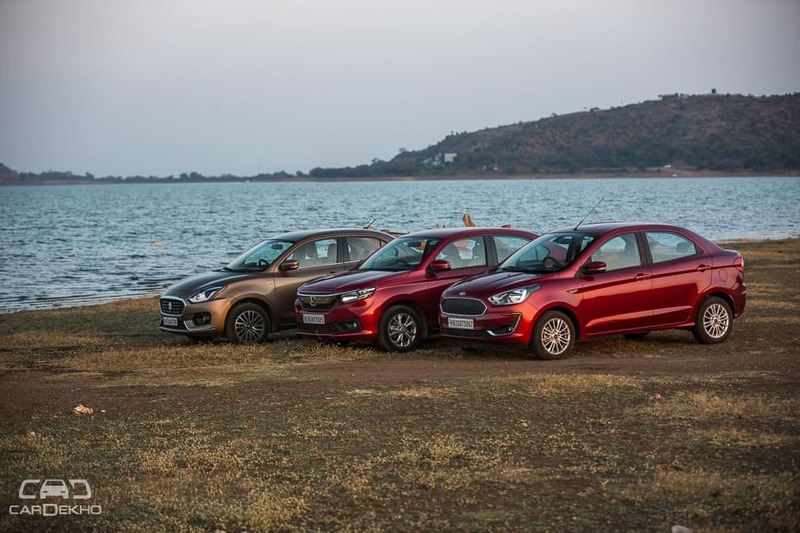 The mesh chrome grille and sleek air dam does help it look upmarket but the headlamp cluster is a letdown, with a plain design and no DRLs or projector headlamps. The sporty 16-spoke wheels give some life to the design but other than that, the car looks rather boring. Even the boot is the simplest of the three and hardly grabs attention. To conclude, the Dzire looks best and has the most accurate proportions. The Amaze’s design, though polarizing, looks sharp and has a presence. And ironically, the newest car here, the Aspire, looks the oldest in this company. First up, let's have a look at the common features in all of these top-spec cars. 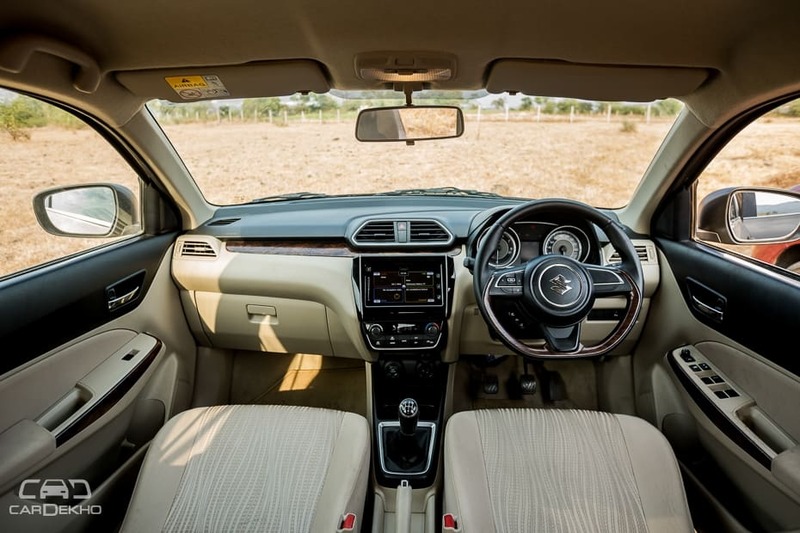 The cabin of the Dzire feels the most premium with a leather-wrapped steering wheel, faux wooden elements and a lot of beige. 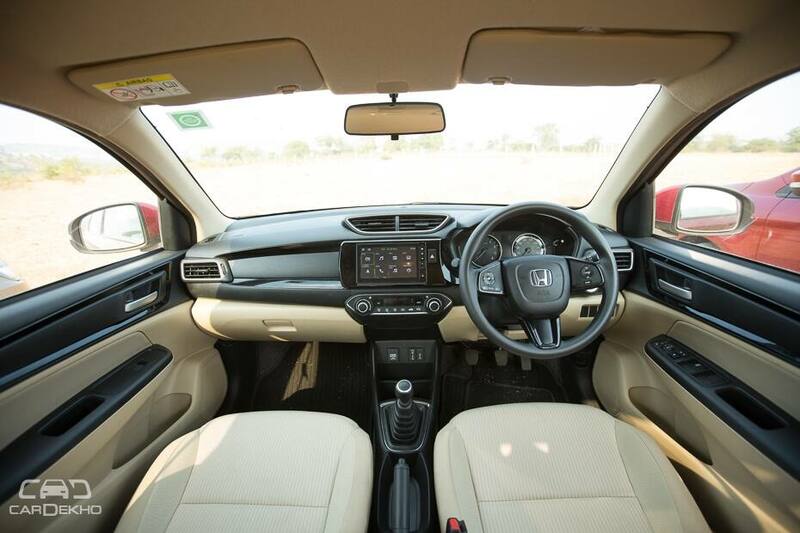 And while the other two cars also get a two-tone interior, their cabins are dominated by black and hence don't offer the same sense of space as the Maruti. The centre infotainment display is tilted towards the driver for better ergonomics but the response from the Suzuki Smartplay unit here isn't as quick as the other two, which get an almost tablet-like interface. The Dzire, like the Aspire, gets automatic headlamps as well. The Honda Amaze’s dashboard has an old-school charm. The fit and finish of the cabin feels good and the arrangement of the infotainment screen and the buttons looks clean. Furthermore, even though the Amaze is a budget car, the use of piano and matt black plastics help it look more premium. Also, the Amaze is the only car here which does not get a connected centre tunnel, thus giving it a lot of storage space. But the sense of premiumness goes down a notch with the kind of materials used in the cabin. It's the small stuff like the rubber cover of the gear stick or the tacky steering-mounted buttons that take away from an otherwise good experience. 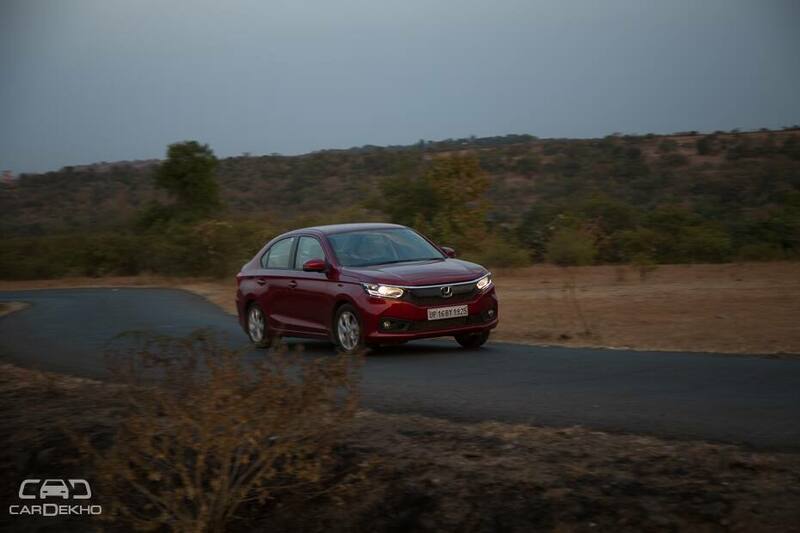 In terms of features, the Honda Amaze is the only one to get cruise control, which can be useful on highways. 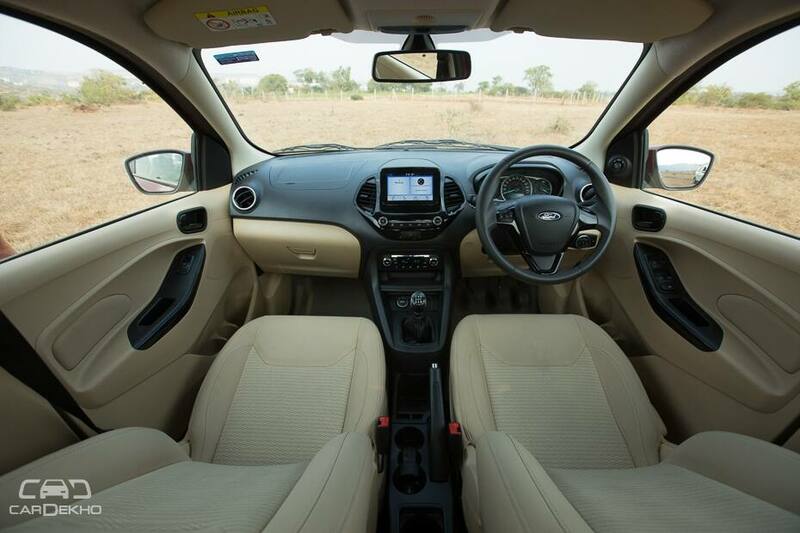 The Ford Aspire gets a smart layout of the dashboard with a floating touchscreen. The big centre tunnel looks good but eats into the leg space. Nevertheless, it gets a dedicated smartphone tray which is quite useful. Even in terms of features, the Aspire impresses with an auto-dimming IRVM, which the other two don't get. But the steering wheel is made of hard plastic and doesn't feel as premium to hold. Even the instrument cluster looks bland with a less detailed MID compared to the other two. The quality of the plastics on the dashboard and doors also leaves you desiring more. If you are looking to seat 3 at the back, the best car here is the Aspire. Additionally, it gets the quietest cabin as well. 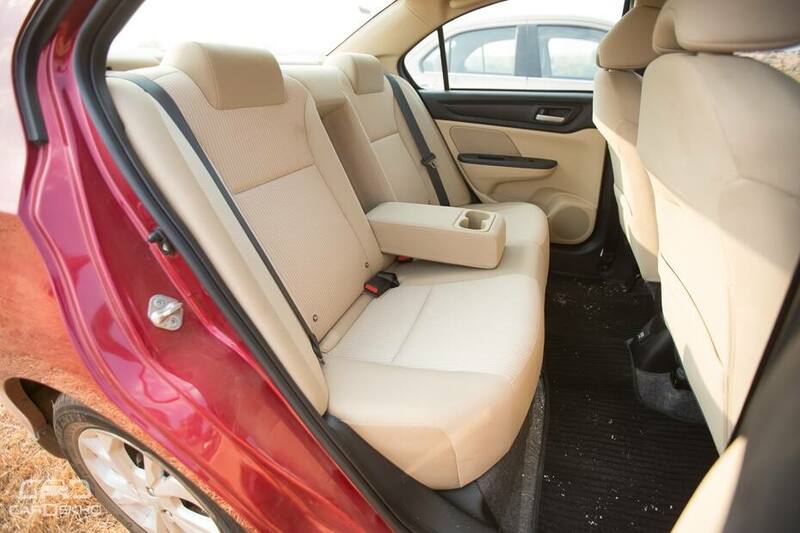 While the Aspire offers the most seating space, it skims of the rear seat features. There are no cup/bottle holders in the doors or the armrest, no AC vents and it does not even offer a 12V charging socket. The Amaze offers the best balance of seating three and features. You get ample storage with cup holders in the armrest, bottle holders and a 12V charging socket as well. The seat cushioning in the Amaze is softer than the rest. Combined with the softer suspension, the Amaze feels very comfortable over broken roads. The window line is also low, which makes the cabin feel airy. But the Amaze is the only car here which does not get adjustable rear headrests. 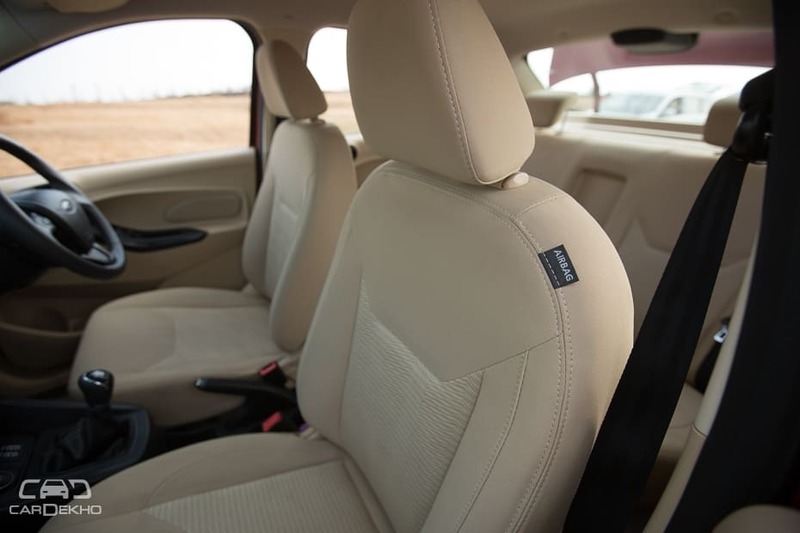 But if your priority is seating 2 at the back, the Maruti Dzire has the go-to seats. Not only is the contouring better and more supportive, it also gets a lot of storage options and features similar to the Amaze. 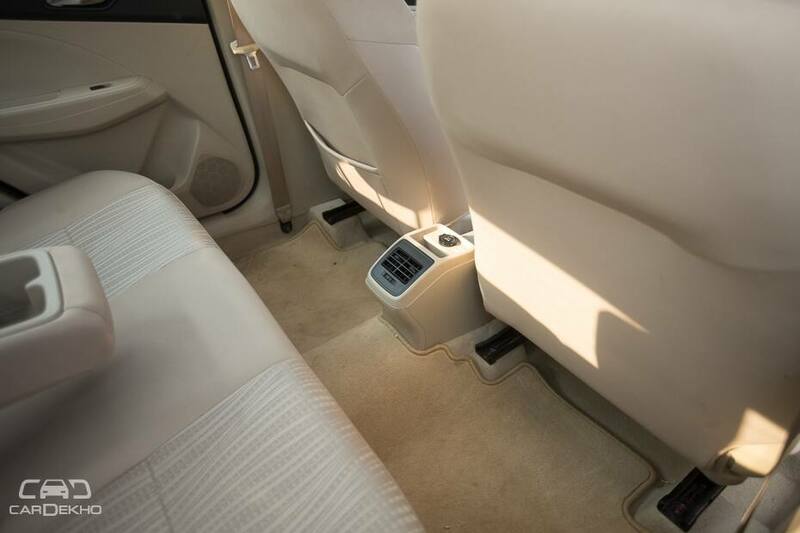 There are rear AC vents and a mobile holder for the rear occupants. But because of the high window line and the large front headrests, the cabin feel a little cramped compared to the other two. You get the best head and knee room as well. 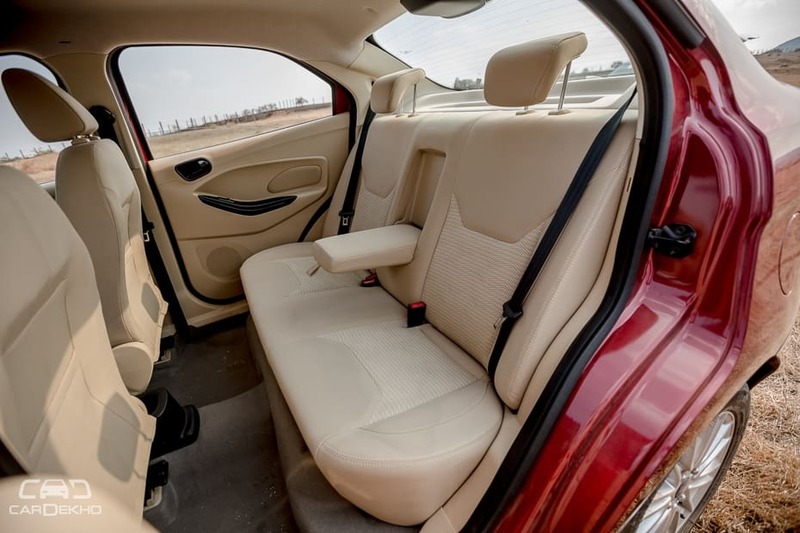 And though on paper, it's the Dzire which has the maximum shoulder room, the door armrests are a little intrusive. To conclude, the Amaze offers the best balance between seating two and three, and the features offered. 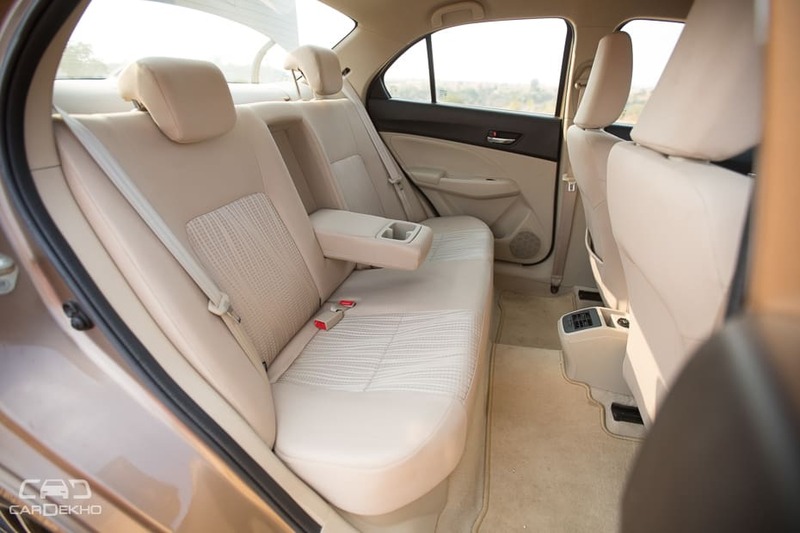 But if you often seat just two at the back, the Dzire offers the best experience. Although the Aspire seats three with most ease, it misses out on features and practicality. The Ford Aspire offers the most comprehensive safety kit of the three. It gets 6 airbags along with ABS and EBD. The only thing it misses are ISOFIX child seat mounts. More advanced features like rollover protection and hill start assist are reserved for the petrol automatic. The other two cars offer the same kit with dual front airbags and ABS with EBD. Both the Dzire and Amaze also gets ISOFIX child seat mounts. It's not possible to comment about which of these cars is the safest in the event of a crash. 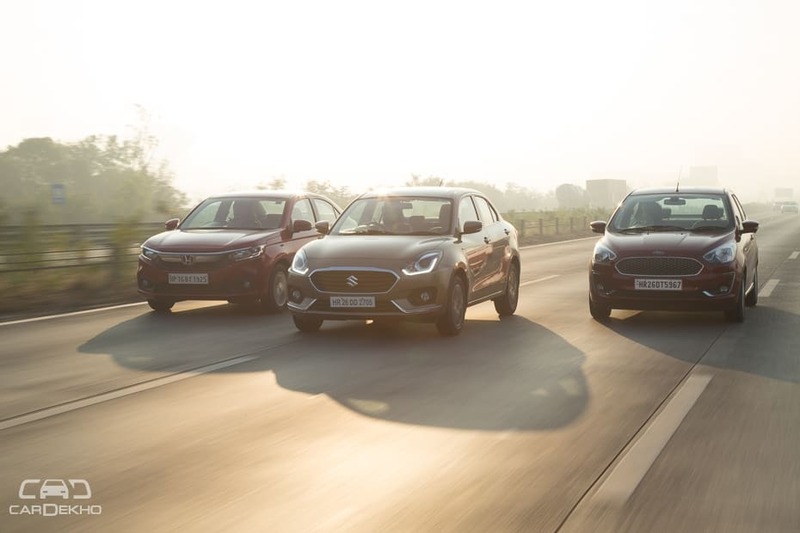 Only the pre-facelift Aspire with two airbags has been tested by Global NCAP, resulting in a 3 star rating, while the other two cars have not undergone the same test. These three cars are the perfect example of how numbers can be deceiving. On paper, the Aspire is the most powerful car, with 96PS under the hood. The Amaze has 90PS whereas the Dzire has just 83PS. But guess what happens when you put the pedal to the metal? The Dzire is the quickest to 100kmph (VBox tested data) with the Amaze and the Aspire close behind. This is because the Dzire gets the shortest gearing here which allows it to climb through the revs quickly. 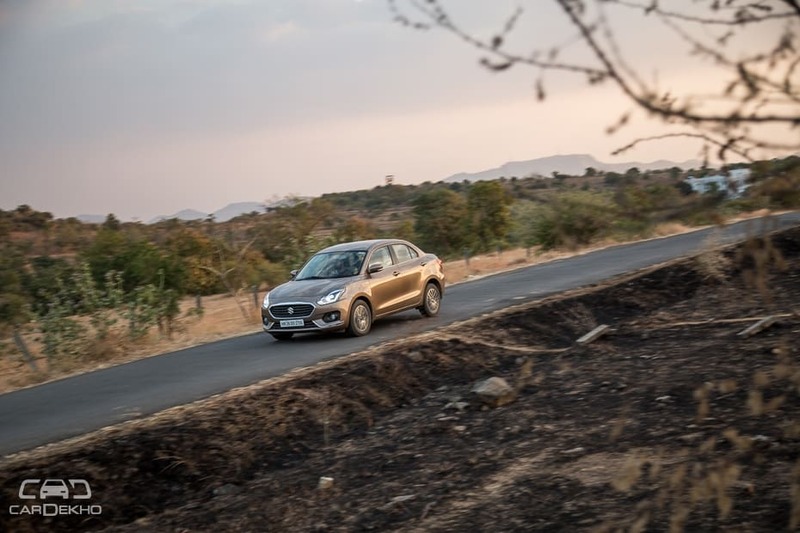 This also makes the Dzire the most reactive car here to throttle inputs, with quicker in-gear acceleration times than the other two. 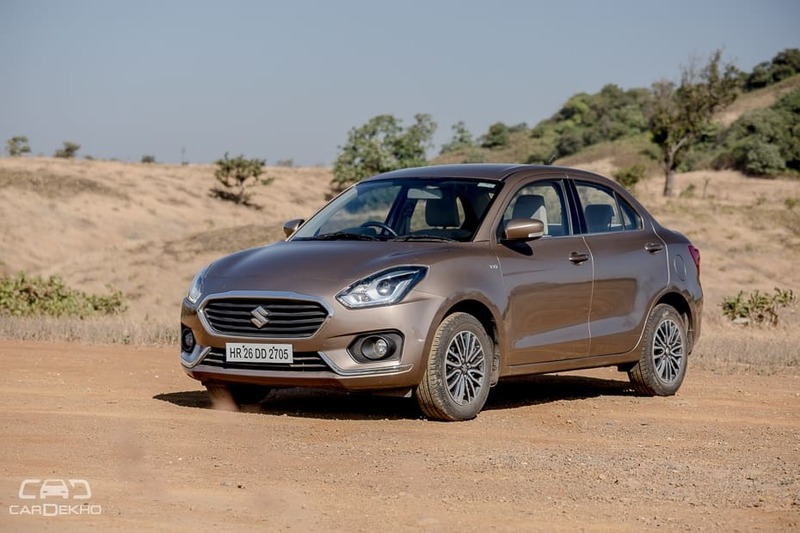 Hence, if you are going to spend maximum time in the city, the Dzire will be the easiest to drive, with the least amount of downshifts for overtakes. The Amaze and Aspire both have similar in-gear acceleration but then it’s the Amaze which has a stronger mid-range. This helps it pull stronger than the Aspire in the city. The Aspire gets the same engine as the Freestyle, but with taller gearing. This has made the experience dull and the Aspire takes some time to climb through revs. It is almost 1.5 seconds slower than the other two in 4th gear acceleration. 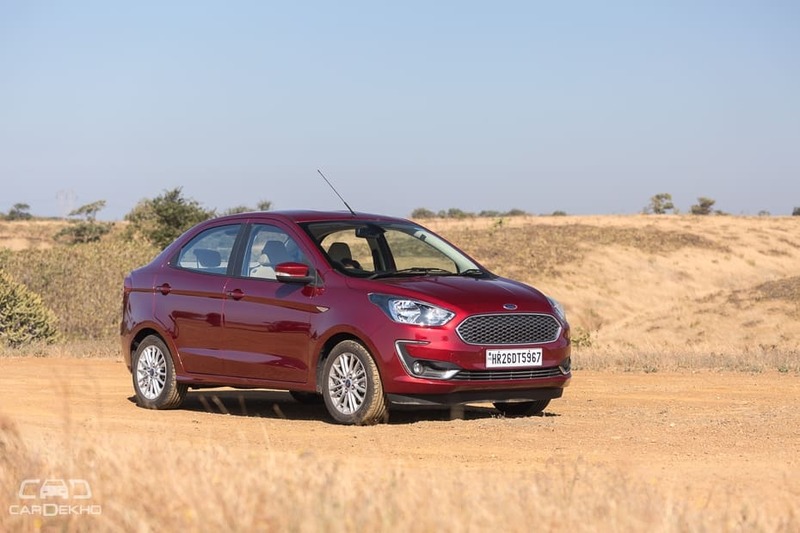 The only three-cylinder unit here is the Aspire’s 1.2-litre Dragon engine, and this can be felt as subtle vibrations do start to creep in the floorboard as the revs rise. Maruti’s 1.2-litre engine is the most refined engine here with the Amaze’s i-VTEC being a close second. On the highway, the Amaze feel the liveliest with the Maruti a close second. Plus, the cruise control of the Amaze gives it another advantage here. For the mileage conscious, all the three car will return close to 15.5kmpl in the city and close to 19.5kmpl on the highway. As for the gearbox, the Maruti gets the most slick-shifting setup with the Amaze feeling a bit notchy. The thing which stands out though is the oddly heavy clutch of the Amaze. The most comfortable car here would depend on the area where you live in. If you are surrounded with broken roads, the soft suspension of the Amaze will be the most comfortable. It absorbs undulations quite well and keeps you comfortable. But at high speeds, this gets a little bouncy and takes times to settle down. Along with the slightly vague feedback from the steering, it takes away from the handling experience. 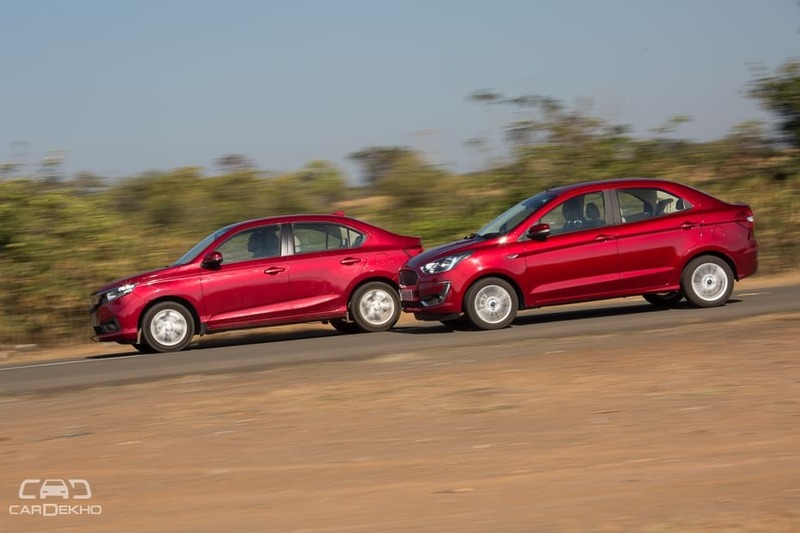 The Ford Aspire gets a slightly stiffer setup compared to the Aspire. Although this setup too keeps you well cushioned from bad roads, the suspension rebound is a little hard and can be felt more prominently at high speeds. In terms of handling, the steering feedback of the Aspire is better than the Amaze but the suspension allows for a bit of body roll which takes away from the confidence. 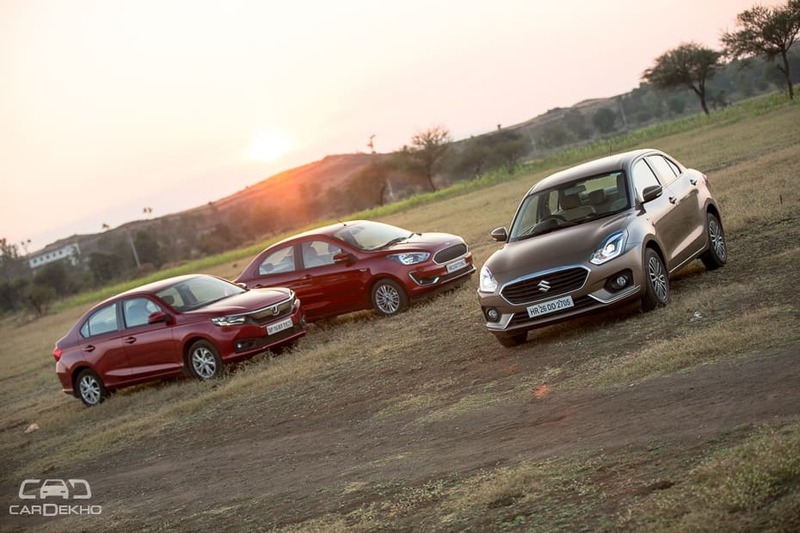 The Maruti Dzire is the surprise here. Not only is it the most lively to drive, it even offers the best handling dynamics. The suspension is the stiffest here which helps it settle quickly after bumps. You will feel a bit of undulations in the cabin, but it doesn't become uncomfortable. Hence, for tier 1 use, this suspension setup makes the most sense. Additionally, this setup keep the car stable at high speeds and cornering. The steering feedback for the Dzire is the best of the three and helps you remain in better control. 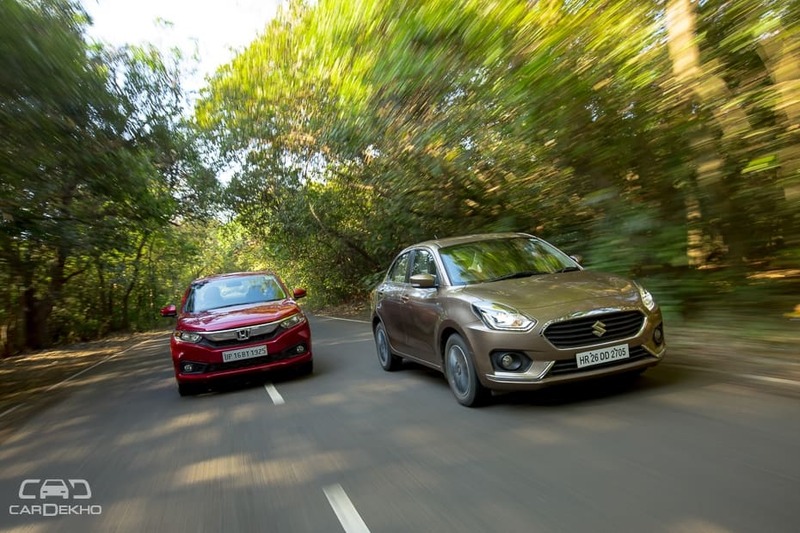 Speaking strictly for the cars tested in their respective top-end variants, the verdict here is quite clear: The Dzire is the best all-rounder and still reigns supreme. But this is only for the petrol manual variants. If you’re looking to buy a diesel check out our previous comparisons here and here for the same segment. 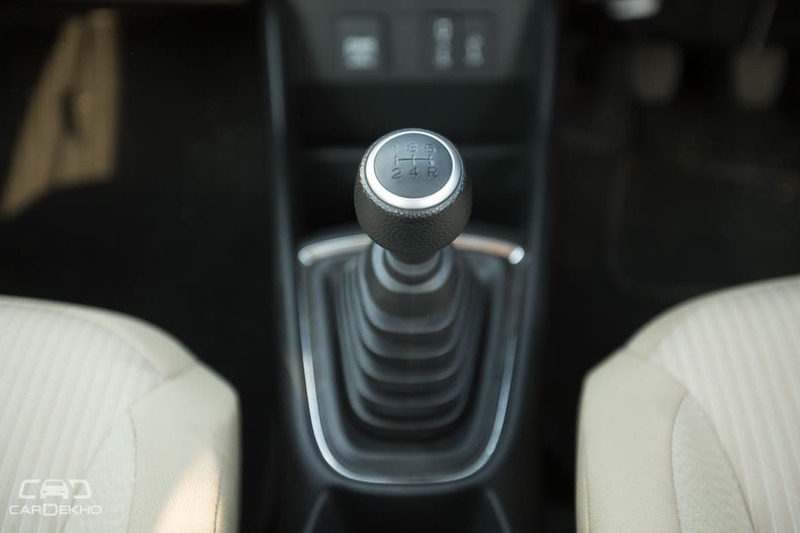 And if you’re shopping for an automatic, the Dzire only comes with an AMT transmission while the Amaze and Aspire both feature better CVT and torque converter automatics. In this specification however, the Dzire gets the best combination of features, looks, drivability and ride quality. 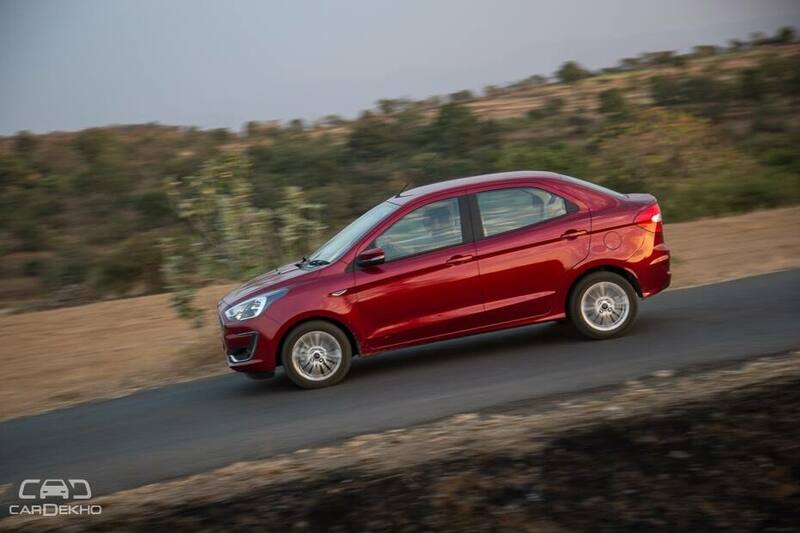 While we do feel it justifies its asking price of Rs 8 lakh, it’s quite a jump up from a mid-size hatchback. It’s hard to pick between the Aspire and the Amaze. At Rs 7.24 lakh, the Aspire plays its value card. It gets a practical set of features at a lower price tag and has the best safety kit as well. But there are a few compromises on the in-cabin quality and the rear seat experience. If safety is your primary concern this is the one to pick. The Honda Amaze does ask for Rs 44,000 over the Aspire, but justifies it in the cabin quality and more flexible engine. It’s the better city car and is the most comfortable over our poor city roads. If you intend to spend more time in the city, the Amaze will be a better fit.